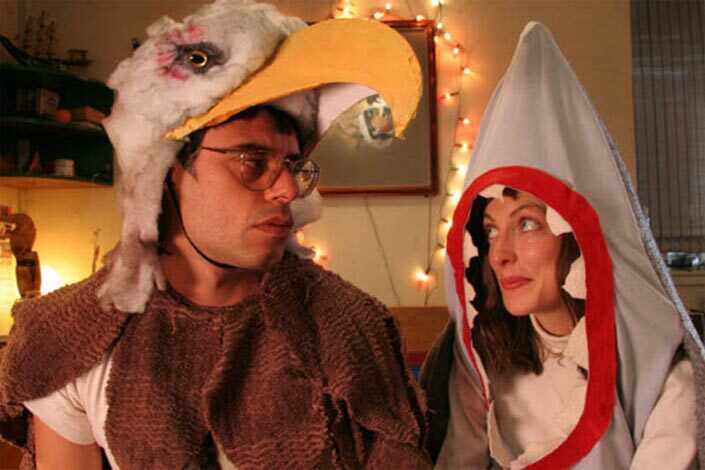 It’s impossible to talk about Eagle vs Shark, a low budget comedy about weirdos in love, without talking about Napoleon Dynamite, a low budget comedy about weirdos coming of age. Taika Waititi’s latest movie borrows so much from the 2004 hit comedy that it never truly escapes its shadow, however hard it may struggle. Both films employ a fair amount of kitsch, relying on nostalgia and absurdist deadpan to milk laughs from the audience. Both films require the leads to be oblivious to their own social dysfunctions, allowing audiences to laugh freely at the characters, not with them. The humor isn’t mean-spirited; rather it’s more like going to the zoo. The film begins with the socially-inept fast-food worker Lily crushing madly on the eccentric, mullet-wielding video store clerk Jarrod (played by Jemaine Clement, co-star of HBO’s Flight of the Conchords). Jarrod might as well be Napoleon’s foreign cousin, with his slack-jawed deadpan and off-kilter ideas of machismo (they should revive Perfect Strangers and cast these two guys as the leads). After indirectly inviting the timid Lily to an animal-themed costume party / video game tournament, the two begin their romantic journey, involving a trip back to Jarrod’s hometown. There, Jarrod deals with his family issues and some ancient skeletons in his closet, as Lily smiles and acts like the delicate flower that she is. Interspersed are jokes about martial arts training, homemade candles and make-up kit salesmen, which are presented in the exact same way that jokes about dance training, tater tots, and Tupperware salesmen were delivered in Napoleon Dynamite. Mr. Waititi does a good job of making Jarrod a truly sympathetic character, which isn’t an easy feat since he’s responsible for the bulk of the assholery in this movie. And Lily’s wallflower act isn’t annoying as it is disappointingly one-dimensional. As for the other personalities in the film, there simply isn’t enough there for us to care about them one way or another. Most characters act simply joke fodder, showing up for a scene or two, only to fade into the background. And in the end, after all the forgettable gags and the twee-inflicted romantic episodes (complete with stop motion animation of discarded apple cores), there isn’t a shred of emotional resiliency that remains. These caricatures that populate the movie seem so strange and foreign that it’s incredibly difficult to feel any sort of empathy for their situation. The movie drifts back and forth between awkward stares and genuine laughs unexpectedly, which wouldn’t be so bad if you weren’t provoked to say “well, Napoleon Dynamite did it better. Eagle vs Shark may be a slightly different take on the same story, but the jokes remain the same. It comes off as too familiar, too much of a retread to really give credit to any sort of originality the film might have to offer.